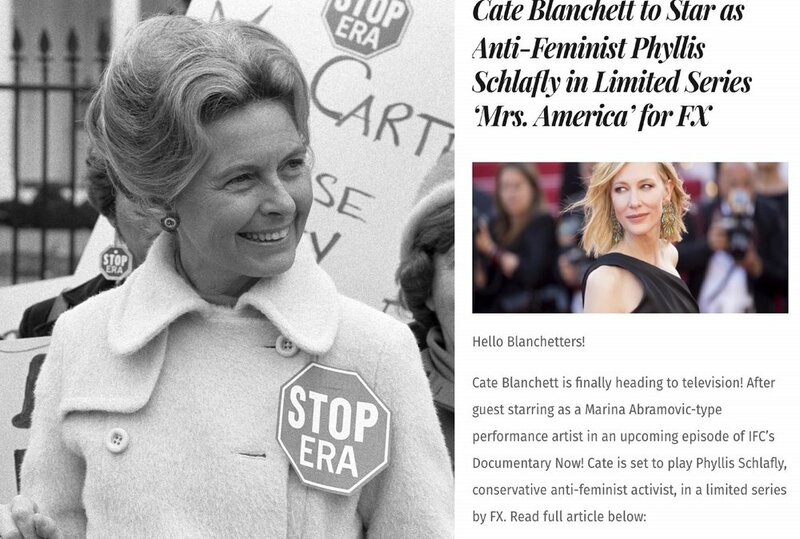 Star actor Cate Blanchett is set to play the indefatigable anti-ERA activist Phyllis Schlafly. It remains one of the most astounding realities of modern life that one American constitutional lawyer. born in St. Louis, Missouri with a law degree from Washington University, a large family and conservative husband, hit the road and brought the Equal Rights Amendment to a grinding halt. Arguing for traditional roles for women in American society, the self-described activist housewife Schlafly went to battle against Gloria Steinem, Betty Friedan, Shirley Chisholm, Bella Abzug and Jill Ruckelhaus. And she beat them. Cate Blanchett is executive producing ‘Mrs. America’, in the upcoming limited nine-episodes series for FX, which is written and narrated through the lens of Schlafly’s feminist opponents. ‘Mrs. America’ is being written by Dahvi Waller, the Emmy-winning writer and producer of ‘Mad Men’, another show deeply rooted in evolving gender dyhamics in 20th century America.